It was cold on the East Coast when I left. I wore a jacket all the way onto the plane because the airport’s heaters were spotty at best, and I got off the plane in Los Angeles sweating. My Dad picked me up and we didn’t talk much on the ride home. We planned what to do for the Christmas lights on the house and that was about it,. I don’t say anything back for a little bit, but I do text Scott to see if he’s back from his European tour thing yet. If not, it won’t go through, my phone will just give me that sad error message that blames itself rather than the other person’s phone service. “I really liked elementary school,” I finally say to my Dad after the pause stretched out too long. “I know,” he answers. The house outside is the same house as it always was, the same facade as the house three houses up the street, and four houses down and across the street, but inside is a winter wonderland. Every year it’s beautiful inside our house, with candles on every surface and a giant 9 foot tree and enough stockings for 3 or 4 large families and ceramic elves peaking out from unexpected corners. My Mom hugs me and offers me coffee from a thermal carafe, which I drink even though the caffeine is going to keep me up for the rest of the night. The three of us talk for a little bit and then retreat into a book (Mom), a movie (Dad) and my old room (me). Not a lot to update thanks to Facebook. Scott texts back that he is home and a sad face about the news, and after I take stock of my room’s recent paint job and my closet door’s mirror fixed, I leave. “Can I borrow your car? I have to do some last minute Christmas shopping.” My mom says I can’t use her car and my dad says I can, so I take her keys and drive and pick up Scott. I don’t need to Christmas shop, but I don’t want to be in the house very much. “It’s weird to be home,” he says when he gets in the car. We drive aimlessly, until some high school memory track kicks in and I’m already driving over to Barnes and Noble, where we wander the aisles and I pull out titles for him to read. He buys one and we leave, bemoaning a lack of pretty girls sitting in the easy chairs. The conversation is of a high school vintage too. We drive to the mall and walk around the outdoor part, which has been expanded and added to and the ice cream shop has been replaced by an add-your-own toppings yogurt place and the only non-chain restaurant in the mall has been replaced by a California Pizza Kitchen. We both grab yogurts and laugh that there are people in coats. It’s sixty degrees outside, and I’m wearing a hoodie as an afterthought. Scott’s in shorts. The mall closes down at ten, and we’re asked very nicely to vacate by a mall cop that looks vaguely like someone we both knew in Geometry. When we’re back in the car, I remembered the mixed cd I hid in the backseat, which is still there, back from when I wasn’t allowed to listen to music during my first three months of driving. The mix is all ska and punk and a couple guilty pleasure singles from bands that have disappeared since. Scott and I both still know the lyrics and we sing along, especially when Cursive pops up to sing about the daughter he didn’t know he had. “Let’s go anyway,” he says. She does, but she isn’t there, she’s taking the day off to spend with her daughter, who got taken away from her when the guy that knocked her up proved to a court she was addicted to cocaine. We get back in the car with chopped onions and cheddar cheese melting on fries making grease stains on white bags, which we aren’t allowed to open because I know my Mom still holds to the no-eating-in-the-car rule. I don’t put it off anymore. We drive to where the elementary school was, where Scott and I met way back when, where he gave me mix tapes with Weezer and I traded for my mixtapes of Benny Goodman big band. Where I did well and waited for praise like an overeager puppy, and he preferred to blend in the shadows. Where we fought valiantly to be the only geek allowed to play basketball with the cool sixth graders. Where we grew up. It’s green and huge, all of those baseball diamonds side by side. We pull out our bags of lukewarm cheese fries and eat it leaning on the hood of the car. The park is pitch black except one corner, where a stadium floodlight is stubbornly lit. We’re drawn to it like moths, and we find an errant softball and lob it to each other. “I didn’t know we’d made it so big over there,” he says, shrugging. We throw the ball back and forth and I don’t try to assign any meaning to it. I’m only here for a week, I think, and then I can go back home. Posted on Sunday October 10th, 2010 Wednesday March 26th, 2014 by Max Elman. 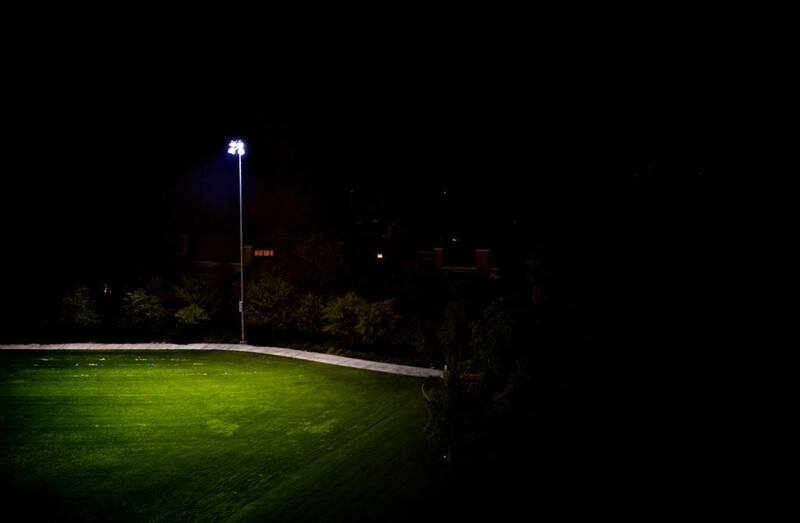 This entry was posted in Photos & Stories and tagged empty, field, lights, night, school. Bookmark the permalink. I'm hoping with everything that you'll be able to come home for Christmas, even though I remember you saying that you probably won't be able to. The only comfort in going home is knowing I have my friends around who can actually relate with how off-putting it can be. Thanks for this. hm. Reading this brought back how I have felt going home…it's like returning back to an old movie set where a lot of the main actors and actresses are either missing or played by a cast that, while oddly familiar, leave you feeling somewhat queer and out of place. And you don't want to take any of it too seriously, it's like a lucid dream, you know it will end soon enough. You will wake up and go back home where people know you- not some you from the past they keep trying to revive if they talk about it enough. That's strange – I tried to make them not sound like Mom and Dad, since everything else was so similar. Dad and I have a very easy time talking, and there is no way I would come home and only talk for a little bit to both of them. I gave them similar traits but different characteristics I guess? I dunno. I hope they aren't offended by this one.